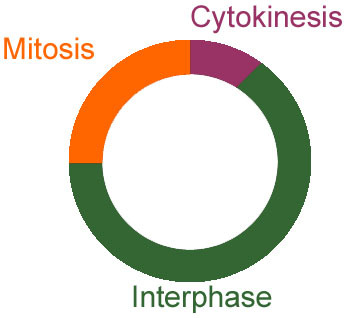 This is the stage of the cell cycle where no division takes place; as the diagram above shows, the cell spends most of its time in this stage. During this stage the cell grows, and towards the end (as mitosis is about to occur) DNA will replicate. This stage can be further subdivided into 4 stages: prophase, metaphase, anaphase, and telophase. Have a look at the diagrams so you are able to identify each stage in an exam situation. The first subphase is prophase, during this the nuclear membrane (membrane surrounding the nucleus) begins to disappear, spindles begin to develop, and most importantly, the DNA condenses from a spaghetti-like mess to the distinct chromosomes you can see. The next stage is metaphase where the nuclear membrane has disappeared and the chromosomes line up on the cell equator. It is closely followed by anaphase where the spindle fibres pull apart the chromatids to opposite poles of the cell. The final stage is telophase, this is where a nuclear membrane forms around the sets of chromosome and the cell begins to seperate into two. Cytokinesis marks the end of cell division and is a seperate stage to mitosis. It is where the cytoplasm splits and the one cell becomes two daughter cells. In animal cells a cleavage furrow forms where the cell pinches in at the equator and seperates off. However in plant cells the cell wall means things are slightly different. A cell plate forms between the two and it later seperates.